While they may look stunning and add wonderful colour, there are certain plants which unfortunately pose a threat to the surrounding areas. Do your bit for the environment and replace invasive plants with beautiful indigenous alternatives. 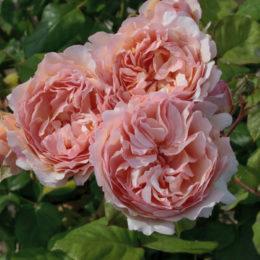 While this climber is undemanding and produces masses of colourful, domed flower heads, birds love it’s ripe glossy purplish-black fruits and disperse the seeds far and wide where the new plants clamber over shrubs and trees smothering them. 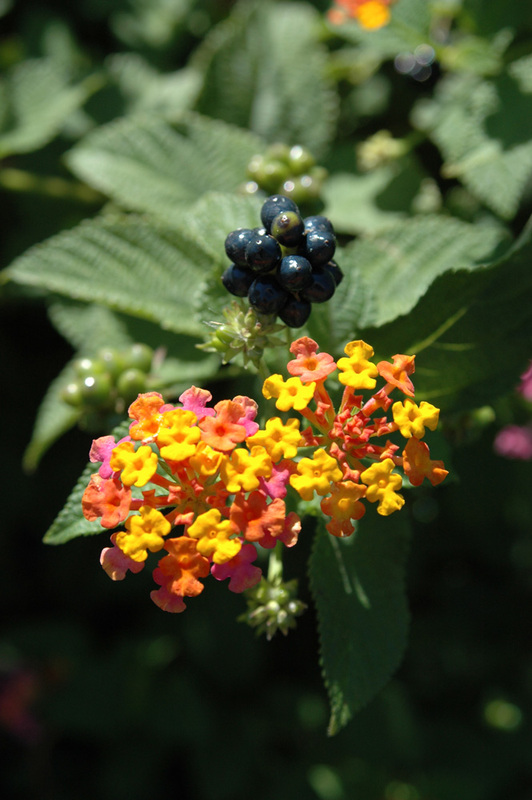 Indigenous alternatives include Burchellia bubalina (wild pomegranate), which, with its bright orange flowers, is the closest substitute for the red and orange lantana. 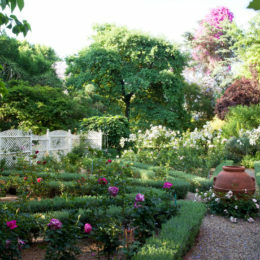 Bauhinia galpinii (Pride of de Kaap) has the same sprawling shape and size. 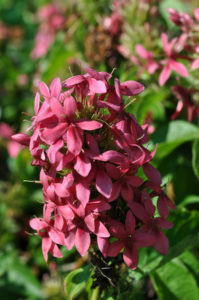 But if you prefer pink flowers, try Ruttyruspolia ‘Phyllis van Heerden’ and the pink butterfly bush Clerodendron myricoides. To create a pretty but prickly barrier with fruit that attract birds, Carissa edulis and the tortoise berry Nylandia spinosa are also ideal. 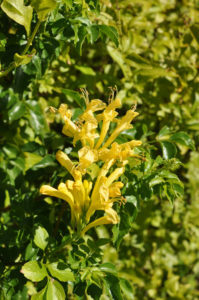 The sprays of bright yellow, trumpet-shaped flowers on this evergreen shrub or small, 4m-high tree, look spectacular in summer. But few are aware that it spreads very easily. When the long seed pods split open, the papery winged seeds fly away and germinate where they fall. They rapidly compete with and swamp natural indigenous species especially in summer-rainfall areas. 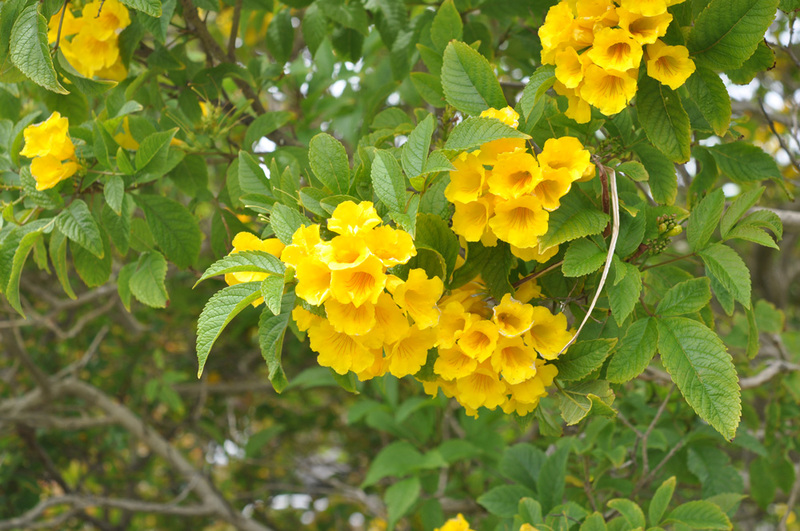 The bright tubular flowers of the Cape honeysuckle (Tecoma capensis), especially the yellow form, make an excellent substitute. 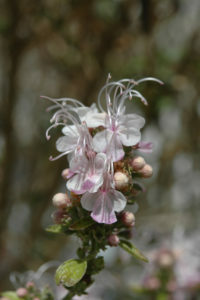 A shrub or scrambler, it’s also a magnet for birds, and as it originates in the Eastern Cape, tolerates dry periods. 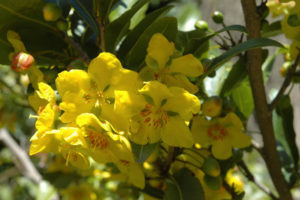 Other alternatives are the Ochna species, which have clusters of cup-shaped, golden flowers and grow into shrubs or small trees; their black berries show up well against the eye-catching red calyx in early summer. 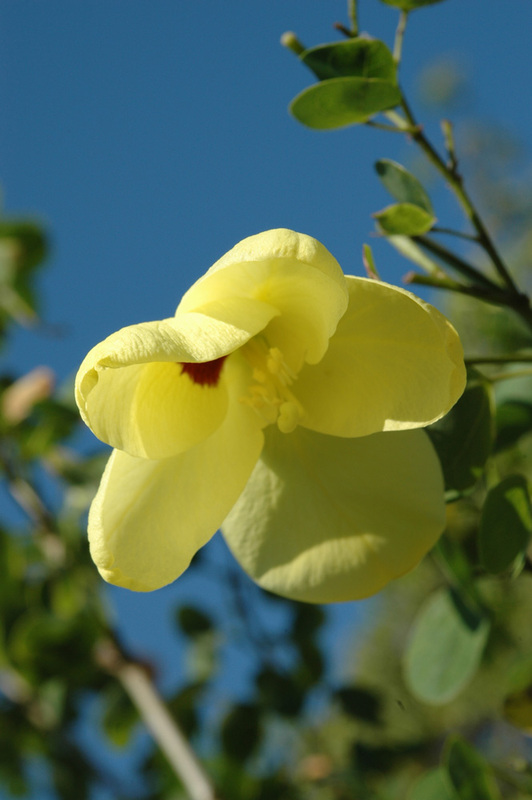 For something more tree-like, try Bauhinia tomentosa (yellow bauhinia). It flowers in summer, has downy seed pods and interesting camel-foot-shaped leaves. 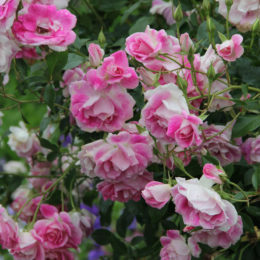 It’s suited to moist coastal areas in semi-shade or full sun. 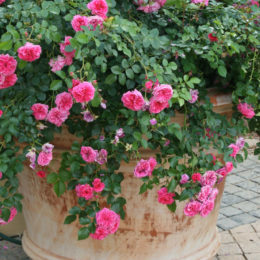 These perennial, moisture-loving plants are grown for their long strap-like leaves and bright yellow flowers. They increase in size annually along the fringes of ponds, rivers and dams where they can block channels, alter water flow and overwhelm indigenous species. In addition to sprouting from discarded rhizomes, they are spread by seed distributed by flowing water. They are toxic and can poison livestock. 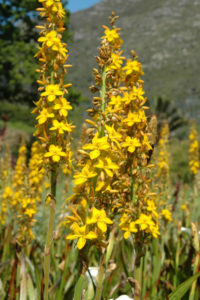 Wachendorfia thyrsiflora (redroot), with its pleated leaves and tall spikes of rich-yellow flowers is a good lookalike. 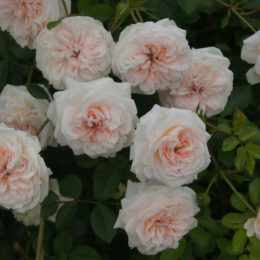 It tolerates frost, grows in sun and semi-shade and likes its feet near water. 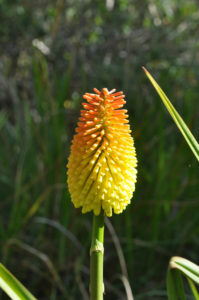 Equally imposing are water-loving kniphofia (red-hot pokers), which have long narrow leaves and fiery red and orange, or plain yellow flower spikes. Different species flower at different times of the year. 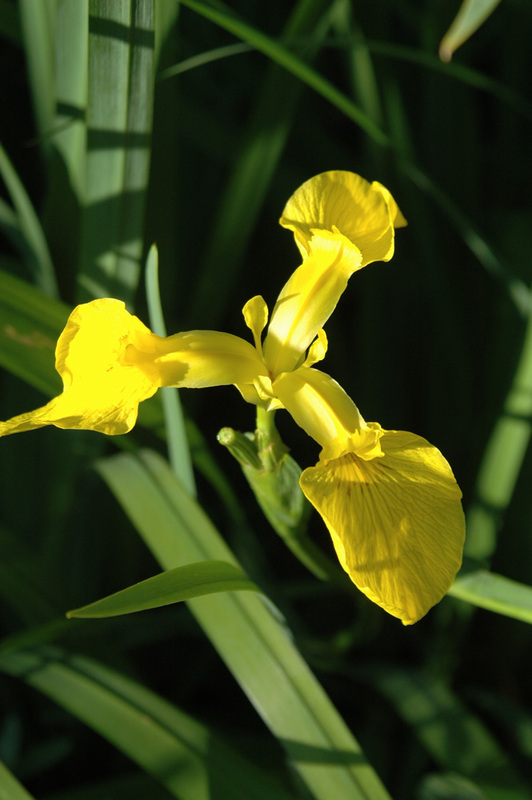 Dietes bicolor, the yellow wild iris, also enjoys wet feet and has narrow strappy leaves and pale yellow flowers.